Celebrate summer at Hudson Terrace, one of the hottest outdoor lounges in New York! Join other young professionals/alumni for an evening of specialty cocktails, gourmet food, and fine jewelry - all to support a great cause! Your ticket proceeds go directly to Let's Get Ready, an education-related nonprofit with official chapters at several Club 13 schools. -- A showcase of the work of avant-garde jewelry designer Miguel Ovalle by internationally-known swimsuit and magazine cover models. TICKETS: $10 in advance, $15 at the door (pending availability), with proceeds to benefit Let's Get Ready. 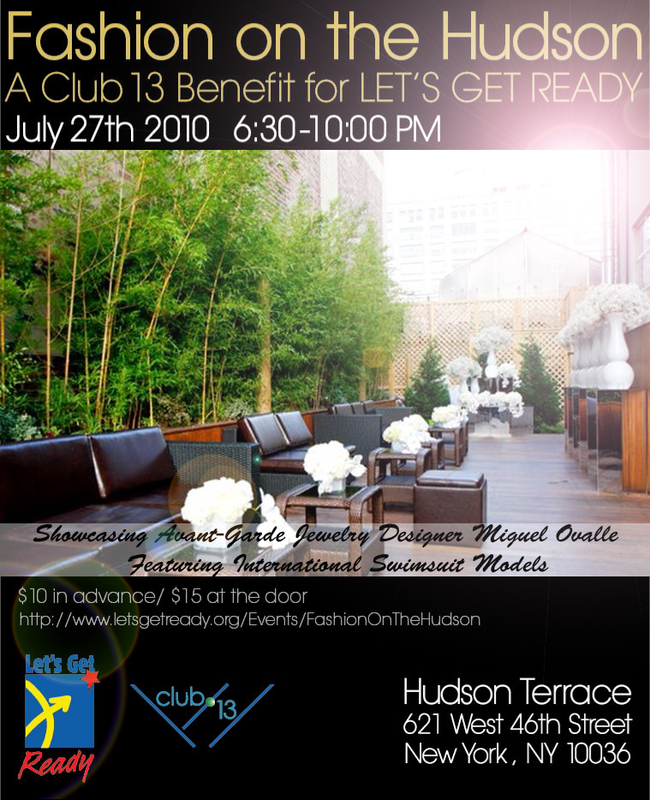 Tickets can be purchased here: http://www.letsgetready.org/Events/FashionOnTheHudson. ABOUT LET'S GET READY: The mission of Let's Get Ready is to expand college access for motivated, low-income high school students by providing free SAT preparation and college admission counseling. Let's Get Ready accomplishes this mission by enlisting college student volunteers who serve as coaches in the program providing not only SAT instruction, but the inspiration, enthusiasm and confidence to go to college as well. For more information please visit http://www.letsgetready.org.